Nancy Rabalais.Credit: <a href="http://www.heinzawards.net/recipients/nancy-rabalais">The Heinz Awards</a>. I was pleased to learn this morning that Nancy Rabalais, executive director of the Louisiana Universities Marine Consortium (LUMCON) in Chauvin, Louisiana, is one of eight winners of the 17th annual Heinz Awards. Twice I’ve been drawn into Nancy’s extraordinary orbit to cover stories—once in the aftermath of Hurricanes Katrina and Rita to report on her dead zone work (The Fate of the Ocean), then again last year after ‘Hurricane BP’ to cover her work in the aftermath of a catastrophic oil spill (The BP Cover-Up). The Louisiana Universities Marine Consortium. Credit: ©Julia Whitty. Oil near pelican breeding grounds in Louisiana marshes, May 2010. Credit: ©Julia Whitty. 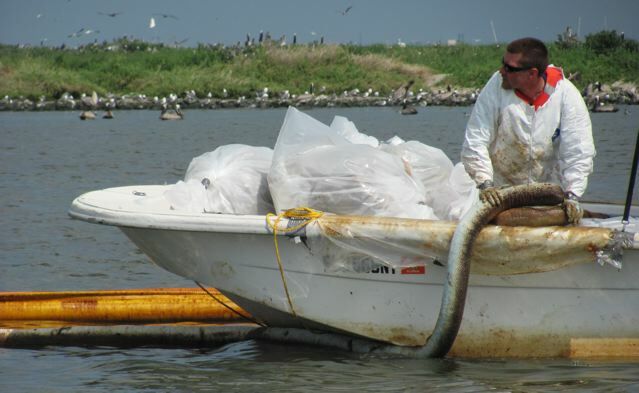 … on the forefront of efforts to develop and implement large-scale restoration plans for the beleaguered Gulf Coast waters. For decades, [Nancy Rabalais] has continued to be the driving force behind identifying and characterizing the dynamics of the Gulf’s dead zone, which exhibits dangerously low oxygen levels to support vibrant marine life. By studying sediment cores extracted by her team from the Gulf, Dr. Rabalais discovered that the Gulf’s oxygen depletion worsened dramatically since 1950, almost in direct proportion to the use of nitrogen fertilizer that flowed from farming areas into the Mississippi River. This, along with other factors, have led to the Gulf’s dead zone totaling over 7,700 square miles in 2010, the largest in the United States and the second largest worldwide. Her findings were met with political opposition and skepticism from some in the scientific community. She is currently working to help the Gulf recover from the damage caused by the 2010 oil spill and testing whether bacteria that feed on the oil could be contributing to the Gulf’s low oxygen areas. So, kudos, Nancy Rabalais! I can’t think of another researcher working so courageously in combat conditions on the environmental and scientific frontlines of the 21st century.